Boeing sales chief Ihssane Mounir, speaking at Boeing’s closing press conference on the last business day of the Farnborough Air Show. The material from which Boeing fabricates the fuselage could have a significant bearing on where Boeing decides to build the plane. Just one day after a major aviation player told the Seattle Times that Boeing’s proposed new 797 airplane might have a metal rather than a carbon composite fuselage, a top executive at the jetmaker threw cold water on that outcome. “We are committed to continuing looking at a composite structure,” said Boeing sales chief Ihssane Mounir. 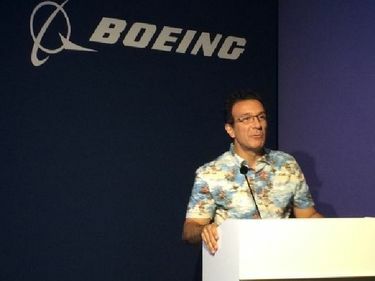 Air Lease Corp. executive chairman Steve Hazy, in an interview Wednesday in London, had said Boeing is weighing all options to reduce the cost of building the plane and that the expense and complexity of composites manufacturing might not be the way to go. “My gut feeling is that the new aluminum alloys available in the next decade may be a little more cost-effective,” said Hazy. One analyst concluded that the choice of a metal fuselage and a carbon composite wing would favor Everett as a site to build the plane because that factory is already set up with new automated technology to build the metal fuselage and composite wings of the 777X. But when asked Thursday at Boeing’s closing press conference about the report, published online Wednesday in the Seattle Times, Mounir shot it down, strongly implying that the new plane will have an all-composite airframe like the 787 Dreamliner. Mounir’s comment on the likely choice of material is a reversion to what most in the aviation world had previously assumed: that the 797 will have an all-composite airframe. That outcome doesn’t fit Everett’s capabilities quite as neatly as the metal/composites combination. On the other hand, Everett still has the advantage that the new composite wing center is the logical place to build the wings.